The ES-7211PoE 8-Port Gigabit Ethernet Switch offers a flexible and optimized solution for your small scale PoE deployments. The ES-7211 has 8 IEEE 802.3af & 802.3at PoE compliant ports that have a 130 watt power budget to supply even your most power intensive devices. 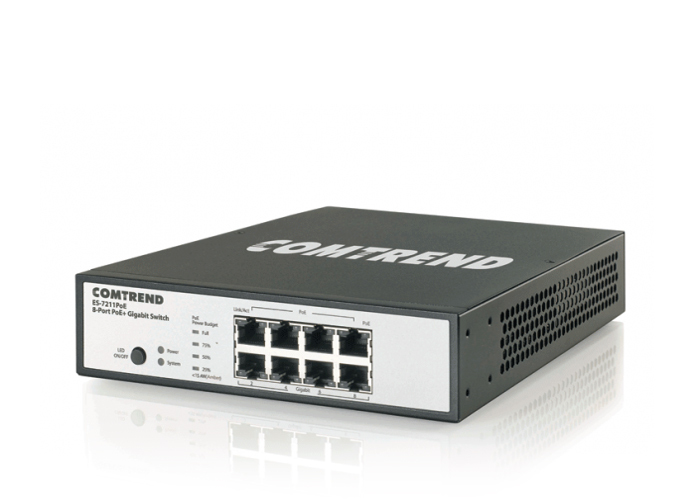 This 8-Port Gigabit Ethernet Switch offers cost savings and ease of installation, making it the perfect solution for your small scale PoE projects. Its unique power budget display also allows you to know what resources are available with just a glance. 8 Gigabit Ethernet Ports, 10x the speed of Fast Ethernet ports. Auto MDI/MDIX – Support IEEE 802.3x Flow Control.